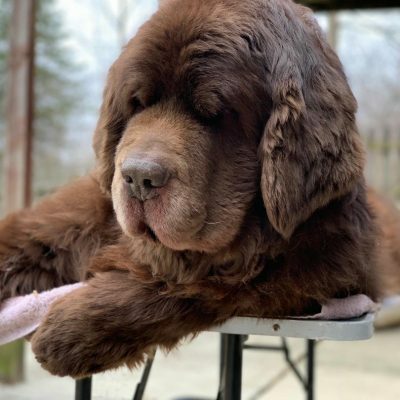 When I was carving out my Newfie pumpkin pattern over the weekend I found myself with the most perfect foam pumpkin Newfie silhouette. I didn’t want to throw it away but I also didn’t know what to do with it. My first thought was to just to glue it on the outside of a pumpkin and call it 3-D and be done with it. My second thought, which was much better than my first thought, was to create a diorama. As soon as that thought hit my head I turned to Pinterest to get some ideas. Is this a thing? 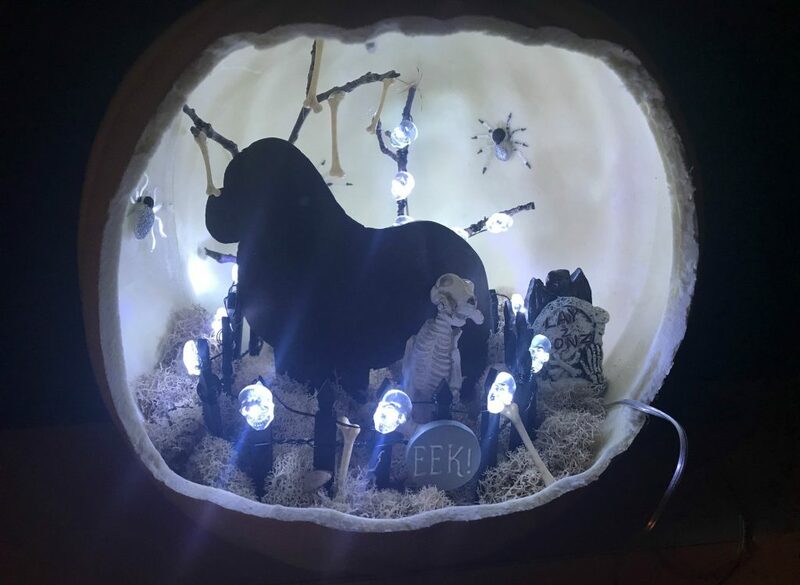 Do people do pumpkin dioramas? You guys, it’s like a fairy garden inside a pumpkin! I’m sure a lot of crafty people already know this, but I’m not considered a crafty person so it’s news to me and it’s fun news! So after way too long of a time searching all these cool ideas, I found a basic theme I wanted to do. 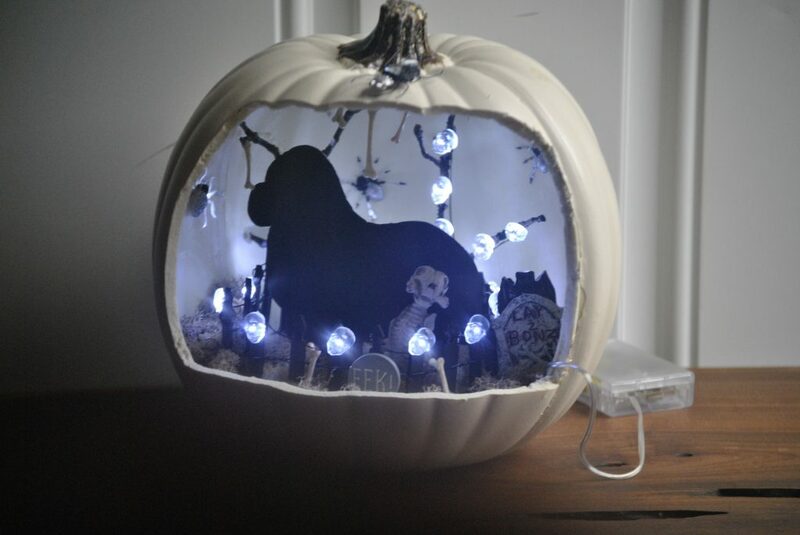 Since I was working with a black cut-out Newf, I wanted to go with a spooky, blue light, white pumpkin kind of theme with a fence. 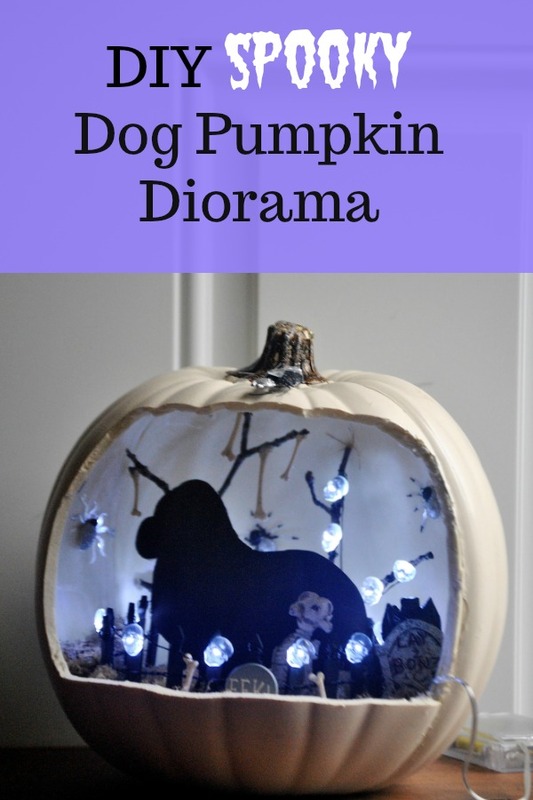 I didn’t find any spooky dog pumpkin diorama designs in my search but I figured as soon as I hit the craft store my mind would explode with more ideas. I went to two different craft stores in our area; Michaels and Pat Catans. They both had sales on all their Halloween merchandise and Michaels had their foam carvable pumpkins on sale for $7 which was down $3 from the day before when I was there. I bought all my stuff, came home and got started! Sticks from your backyard or you can buy them at the craft store. Mini Led lights or battery operated tea lights. 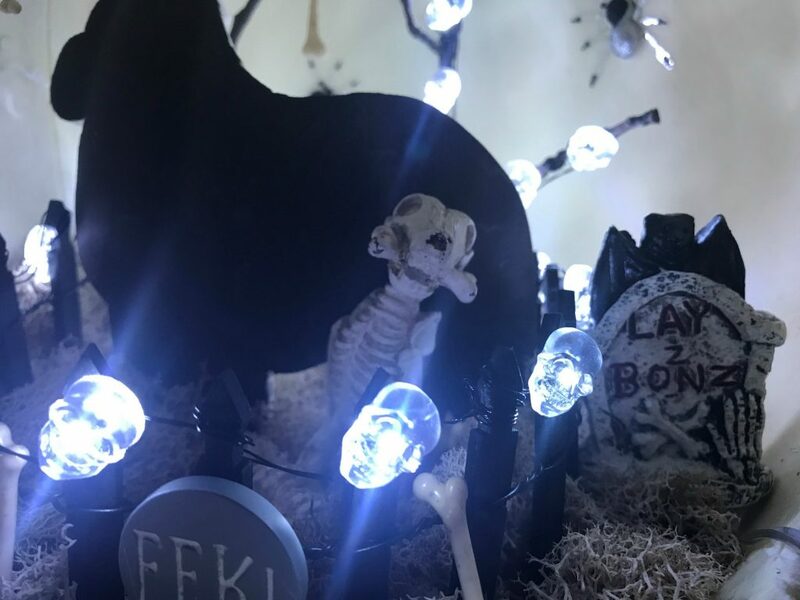 In my pumpkin diorama, I have moss, a skeleton dog figurine, a tombstone that says Lay Z Bonz, skeleton bones, a black fence, a stepping stone that says EEK, mini skull lights that are battery operated, 3-D spider stickers and of course-the BIG Newfie cut-out from our previous pumpkin carving. Place tree branches inside the pumpkin -I didn’t have to glue mine but you might have to. Place 3-D spider stickers into sides and ceiling of pumpkin. My stickers wouldn’t stick so I peeled the sticky part off and hot glued them to the inside of the pumpkin. It was a very frustrating 15 minutes. You can cut a small hole in the back of the pumpkin for the battery pack. I did not do this and just ran the cord on the outside. Stickers don’t seem to stick well to the pumpkin so glue them. If you don’t have a dog silhouette, you can easily search for one on the internet, trace it and then cut it out on some cardboard and paint it. 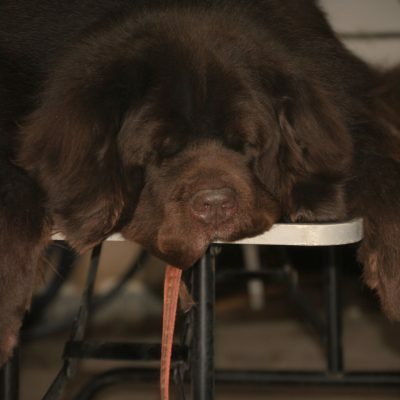 You can also pick any type of focal point you want, it doesn’t have to be a dog but dogs are cool. 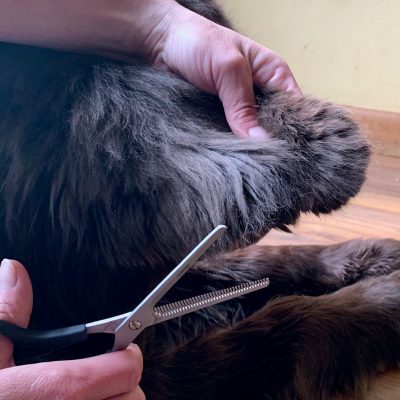 Keep the hot glue gun away from your Newfie. My daughter and I were doing these in the kitchen and we had the glue gun set up on a folding table close to the outlet. Nosey Leroy came up right as we were both arms deep in our pumpkins, knocked the table over and dragged the glue gun through the house on his tail. Thank you! My daughter and I had so much fun making these this past weekend! Hers was a little more fall like with pumpkins and it was adorable! How fun!!! Don’t forget the paper towels and/or a small drool towel! Best of luck to her! It all happened really fast. Tables were flying, cords were getting ripped out of walls. It was typical Leroy fashion. I am so not a crafty person either!! I think I can do it and then when it comes time to be crafty I’m like no 🙂 I’m happy to catch up with you all. I blogged at cocoabeanadventures and then stopped and we’re back!! Excited to see what everyone is up to. We have a new name lovecocoabean.com.